As businesses continue to grow and streamline their production processes, it is important to consider the time and costs involved in the recycling or disposal of industrial process water. Water used as coolant, for example following an extrusion process, or water from hot water wash tanks, often must be treated before disposal or re-use. Fragments of material such as plastic or metal can be present in the water, left behind following the washing or cooling of an object after production. Silt, sand, grit and other foreign particles can also build up in industrial wash tanks, cooling tanks and IBCs. This contamination can cause damage to the product and downstream equipment, resulting in higher disposal costs. 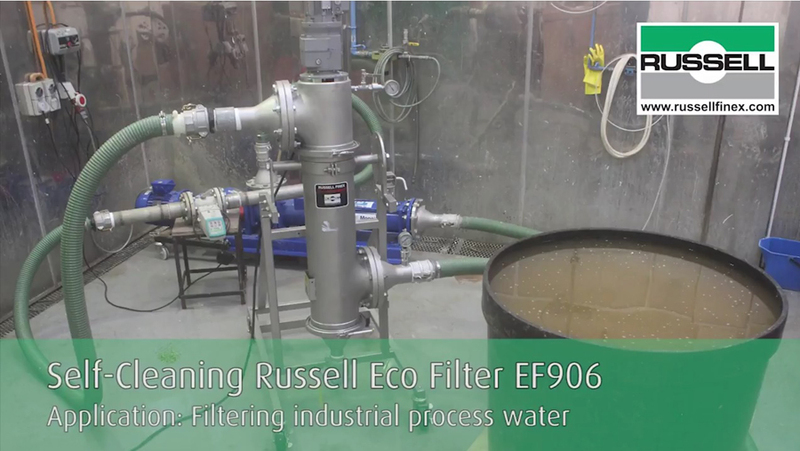 In a Russell Finex demonstration video you can view how industrial wash water is filtered using the Self-Cleaning Russell Eco Filter®. This range of industrial water filtration systems can be easily installed in any part of the production line, to eliminate oversize contamination from liquids and effluent. The contaminated wash water is pumped through the high performance industrial filtration system, where the dirt, silt and other contamination is removed. The recycled wash water can then be reused in the production line, or safely disposed of. The Self-Cleaning Russell Eco Filter® reduces production downtime, benefiting from a unique self-cleaning design, with no stoppages to change filter elements, and no slowing of throughput due to blockages. These industrial liquid filters are totally enclosed, meaning limited operator exposure to the process liquid, and are available in horizontal and vertical orientations to suit different installations and improve accessibility.